All our fabrication facilities are certified with global standards and fabrication works are carried out in accordance with the internationally recognized ISO 9001-2008 OHSAS 18001-2007 and ISO 14001-2004 standards under an Integrated Management System to maintain the highest global standards for Quality, Health & Safety and Environmental Management systems. 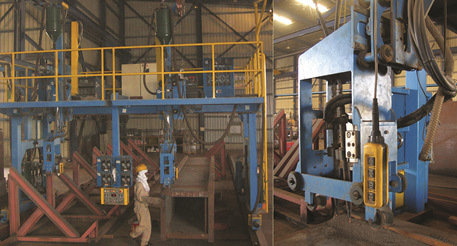 The plate processing machine supplied by Peddinghaus, U.S.A, has the facility to punch, drill, mark and cut plates using plasma or oxy/acetylene of thickness up to 75 mm. 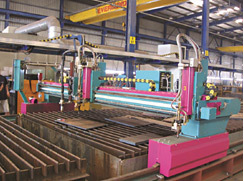 CNC Controlled Plate cutting/ profiling machine supplied by SATO Cutting Systems, Germany, has the capabilities to process plates up to 24m long x 5m wide of 200 mm thick (max) by using oxy/acetylene or plasma cutting facilities. This heavy duty saw and drill supplied by Kaltenbach, Germany has the ability to cut sections of width 1340mm and height 730mm, capable of sawing at variable metering and automatic drilling with three-axis drill facility up to a diameter of 40mm. 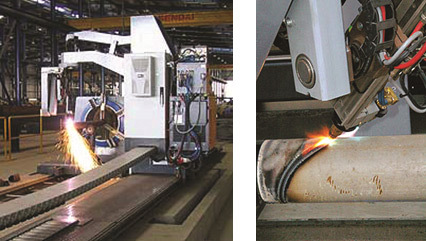 The coping machine which is part of the setup is capable of coping and cutting the sections, angles, channels, tubes and hollow sections using its six-axis robotic arm mounted with plasma and or oxy/acetylene cutting torch options. Heavy built-up requirements shall be carried out by using the automatic SAW Gantry Welding machine to build “H” beams, “I” beams and other hollow sections like rectangle and square box sections. Eversendai has got one of the world’s largest sections bending machine. 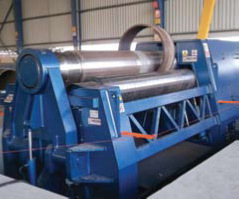 This machine is capable of rolling all kinds of I sections & channels on both axis and pipes. Its operating range includes a maximum of 800mm diameter in pipes and 1000mm depth in sections. This is the technologically advanced, versatile and precise 4-roll plate bending machine that can be controlled effectively through NC & CNC systems. Its operating range is a maximum of 3050mm in width and 60 mm in thickness. 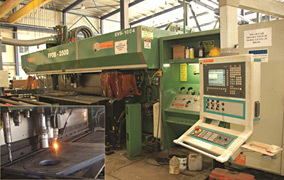 The pipe profiling machine supplied by Muller Opladen, Germany is a six-axis CNC controlled machine utilizing plasma or oxy/acetylene for cutting the profiles on hallow sections. 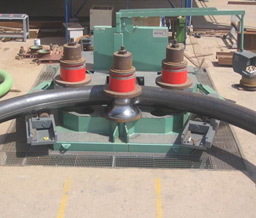 The machine has the ability to make profiles on pipes and square hallow sections with/without weld bevels. Two dedicated auto blasting machines with openings 1600 mm height x 2500 mm width and three dedicated manual blasting chambers (Max. size 20m x 7m x 5m) to cater the needs of the blast cleaning of the steelwork prior to the paint systems application.